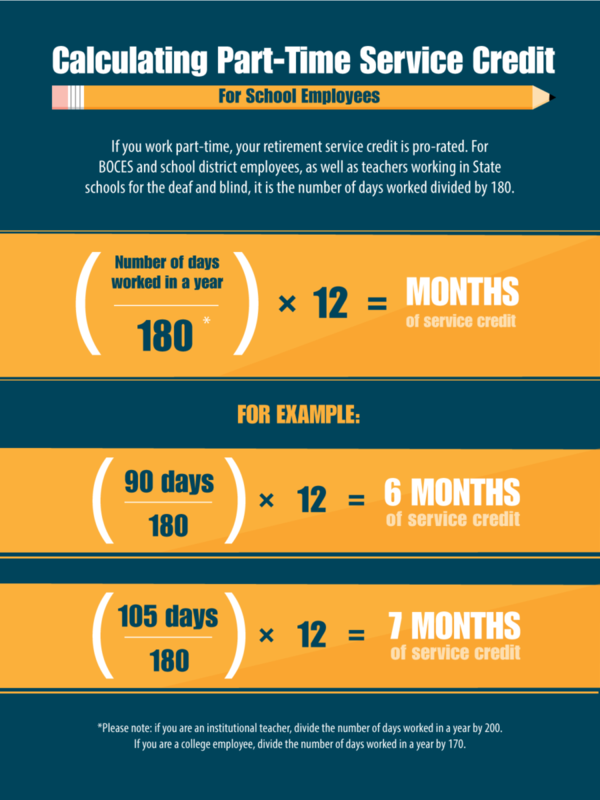 In an earlier post, we talked about how full-time and part-time service credit works for NYSLRS members. We mentioned how earning NYSLRS service credit for workers in an educational setting can be a little different. While most New York teachers and administrators are in the New York State Teacher’s retirement system, other school employees are members of the New York State and Local Retirement System (NYSLRS). In fact, 1 out of 5 NYSLRS members works for a school district. Most work according to the school year, which could be only 10 or 11 months long. So how do we determine service credit for them? If you’re a school employee who works full-time, you receive one year of service per school year. Generally, a full-time 10-month school year requires at least 180 days worked in any school year. Depending on your employer, a full academic year can range from 170 to 200 days. 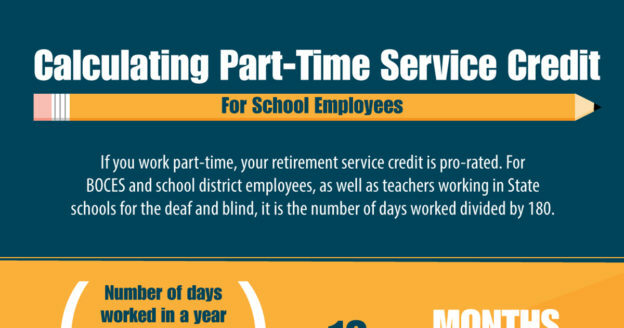 Part-time school employees earn service credit based on the number of days they work. The number of hours in a full-time day is set by your employer (it’s between six and eight hours). If you don’t work full-time, your employer converts the number of hours you worked into the equivalent number of full-time days. Your employer reports that number to us, and your days worked are plugged into the formulas below. Your Member Annual Statement is provided to you every summer. For most members, your statement will show how much service credit you’ve earned for the past fiscal year (April 1, 2017 – March 31, 2018). It will also show your total service credit as of March 31, 2018. Make sure to look it over to see how much service credit you’ve earned over your career. You can also check your Retirement Online account to find your service credit totals. For more information on service credit, read our booklet, Service Credit for Tiers 2 through 6 (VO1854), or your own retirement plan publication. Content last revised February 4, 2019. This entry was posted in General News, Members and tagged BOCES employees, college employees, ERS, full-time, institutional teachers, Member Annual Statement, members, New Members, New York State & Local Retirement System, NYSLRS, NYSLRS Service Credit, Part-time, retirement, school district employees, school employees, Service credit on October 10, 2018 by NYSLRS.